It is important to remove old failing deck stains prior to applying a maintenance coat. Failure to do so can jeopardize the protection and performance of the new stain because it cannot penetrate the wood correctly. 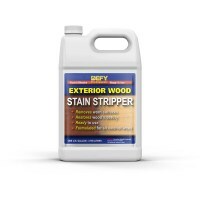 Exterior wood and deck stain strippers are biodegradable caustic products. They work by penetrating through the stain and "softening" the bond between the wood cells and the stain. This allows the stain to be scrubbed from the wood or lightly pressure washed away. In this article, we will look at the different types of decking stains and the overall effectiveness that the deck stain stripper will have on removal. There are may different types of deck stain strippers. 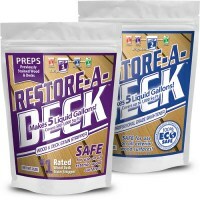 In general, all stripper and stain removers for decks are biodegradable. The majority of stripper will contain the active ingredient of a well know caustic called sodium hydroxide. There are two different ways to buy a deck stripper. In a liquid ready mix formula or in a powdered formula. Professional Wood and Deck Strippers for all types of wood. These products will help in the removal of all transparent and semi-transparent exterior wood deck stains.